Are You Scaring Your Customers? — MAD STRATEGIES Inc.
Are You Scaring Your Customers? Everyone has a different design aesthetic, taste is relative, and clever marketing isn't always the most attractive but usually businesses want to attract not repel customers with their advertising message. Many businesses use obnoxious or over-the-top messaging to grab attention but every business owner has to be careful to match a message with the visuals. One of my staff went shopping in Montreal and passed by a good example of how mixed messages can deter rather than attract shoppers. If you have a brick and mortar business your front door and display window is a huge part of your advertising and the message you send with your store design is obviously important. You have to wonder what the store owner of this bridal boutique was thinking when he or she arranged these mannequins to look like a roving band of goth zombies. The undead and soon to be unbetrothed. Brides generally aren’t going for creepy, moody looks that hide their faces and detract from their ideally gorgeous gowns and expensive hair and makeup. Next door to the bridezillas is an equally disturbing display of creepy children in clothes you won't remember because their odd, possessed expressions and gestures distract you in the worst way. The message that kids can look sophisticated and cute in their new clothes is lost. Never mind that your own child will probably run away after seeing the display. If you have an eccentric store for magick or magic, costumes or comics, and want to surprise and shock with a creepy, bizarre, or provocative display then the crazier the better…but most of us want to surprise in a way that is inviting to customers. FAO Schwartz was known for decades for their eye-catching holiday storefronts that created such a buzz even kids couldn't wait to go shopping and Radiant Plumbing has a great changing display that makes looking at toilets a blast as well as ensuring you remember them. 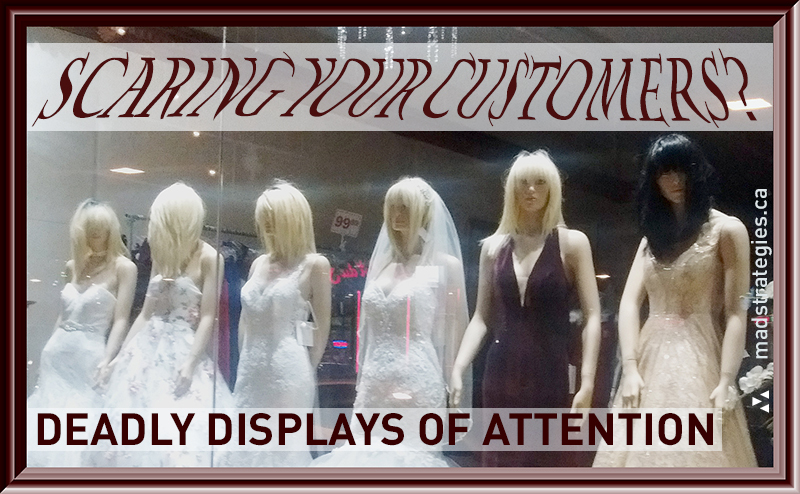 Know your customers and don’t forget to advertise accordingly so your store says who you are in a good way. Is your visual message killing your business? Are you saying the right thing the wrong way?